Spreading the Word; this is what car magnets do best. Imagine your church’s car magnet on hundreds of cars in your town. Those magnets will be spreading your church’s message 24 hours a day, every day of the year! Plus, each of those magnets will be seen by hundreds of cars ever day. Talk about exposure! 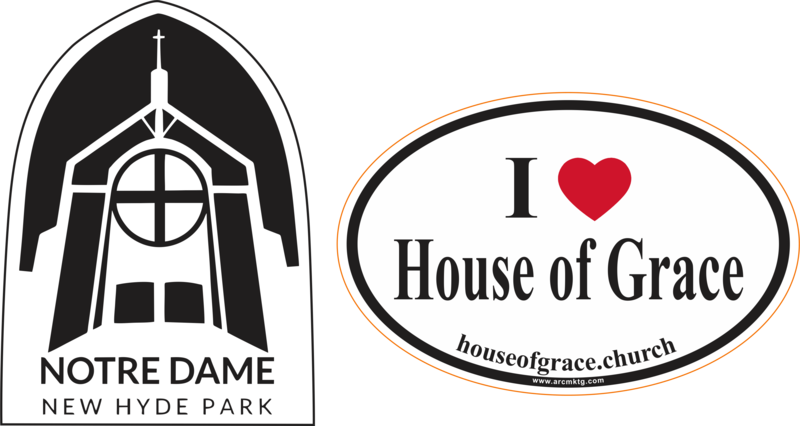 Car magnets are the perfect way to appeal to new members and are a great way to acknowledge your current congregants. What does a well-designed church car magnet look like? Most churches follow a similar format and an ARC Marketing designer will guide you through the process. Most churches use their logo in the center of the magnet (don’t have a logo? We can help!). Of course, the name of the church goes at the top/center of the magnet, since this is where it is most noticeable. At the bottom of the magnet is a great area for your mission statement or outreach focus. This would also be the place to put your town name if you don’t wish to use a mission statement. Some churches give the magnets to their members as a gift, and just let the magnet broadcast their message. However, most churches sell these to the members as a fundraiser. They can use the proceeds from the fundraiser to fund their outreach programs, day care center, etc. Is it hard to get started on a custom car magnet? Not if your working with ARC Marketing. We’re going to be doing all of the heavy lifting throughout the entire process. You just give us a call and we will design your magnet, print your magnets and deliver them to your door; all in about 2 weeks!